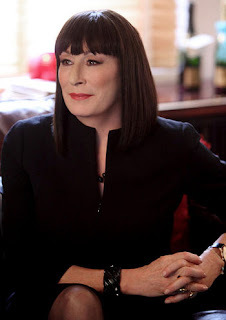 Anjelica Huston onscreen is one word. Power. The preview for "Smash" popped up in my Hulu queue recently. Musical theater? Check. Marilyn Monroe? Double check. Anjelica Freaking Huston? CHECK. "Smash" is a new NBC series that follows the creation of a Broadway show based on the life of Marilyn Monroe. I pressed play without hesitation. But this isn't a review of "Smash". Though I would highly recommend you watch it. The show has an ease of pace and that goosebump-inducing goodness that only a great show tune can bring. 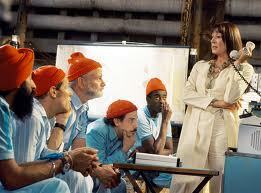 But it also has something else...Anjelica Huston. Just the sight of her literally makes me sit up and pay attention. There's a shot in "Smash" of her defiantly walking down a hallway and it gave me instant chills. Her character on the show is Eileen Rand, a soon-to-be ex-wife whose husband is trying to shut her down and shut her up. Specifically, he wants to prevent her from producing a "My Fair Lady" revival on Broadway. But Rand is determined to produce something, so she secretly sets all the gears in motion on the Marilyn musical. Watching Huston portray a character who is so good at what they do is exhilarating. Every second she spends onscreen is captivating. Exhibit A: I was eight when The Addams Family movie premiered. If you read this blog, you know I had a family that would happily slog to our local cinema to see just about anything. You can bet we were front and center for that one. How did the movie impact me? On Halloween the next year, I was Morticia Addams. Morticia was sarcastic, like the women in my family. She was secure and affectionate and she completely embraced her weirdness...also like the women in my family. Should I be disturbed that such a dark and gothic character held a mirror up to the matriarchs of my family? 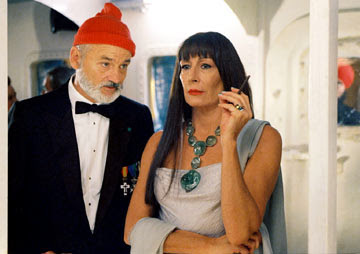 Huston in her roles as Ethel Tenenbaum and Eleanor Zissou are foibles to the man-children that populate Wes Anderson's movies. Huston plays both of those characters as patient but with a line that can't be crossed. Ethel and Eleanor are both exasperated by the slow pace of the people around them. Both characters are so intelligent that they can't help but face a life of frustration. Who could partner with a woman like that and hope to keep up? Well, according to the films...no one. These are magic movies for me, I ramble on about them a lot. But so much of that magic comes from Anjelica Huston and her almost ethereal onscreen presence and impeccable comedic timing. Exhibit C: Huston once had a long guest arc on the show Medium. She brought the exact same gravitas and toughness for which she is frequently cast, but put a new twist on the theme. Her character, Cynthia Keener, is a private investigator with secret motivations. But this character is far more vulnerable. She's peeling like wallpaper. She's on edge at all times. Still powerful, but that power is seeping through the cracks of a fragmented woman and it's not under control. And her arc doesn't have a nice neat ending. But it does have a satisfying one. Sorry to be cryptic, but I don't want to ruin it for anyone who hasn't seen it. It's one of my favorite A-list guest arcs on a TV series. 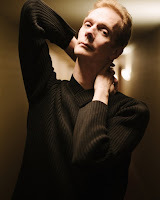 If I look for the commonalities in these performances, I find layers. I see complexity and authenticity. She portrays contradictions and convictions very well. And let's face it...she's gorgeous. Someone, write AH an action movie. I'm obsessed with action heroines. Give me swordfights or give me death. (There's another blog for that entirely...but I'm thinking of combining that one and this one.) Anjelica Huston is sort of like the Shakespearean version of an action heroine. She has all the toughness, the signature eyebrow-raise, and the dominance of Ripley from Alien. But she tempers it all by tapping into a deep well of emotion. 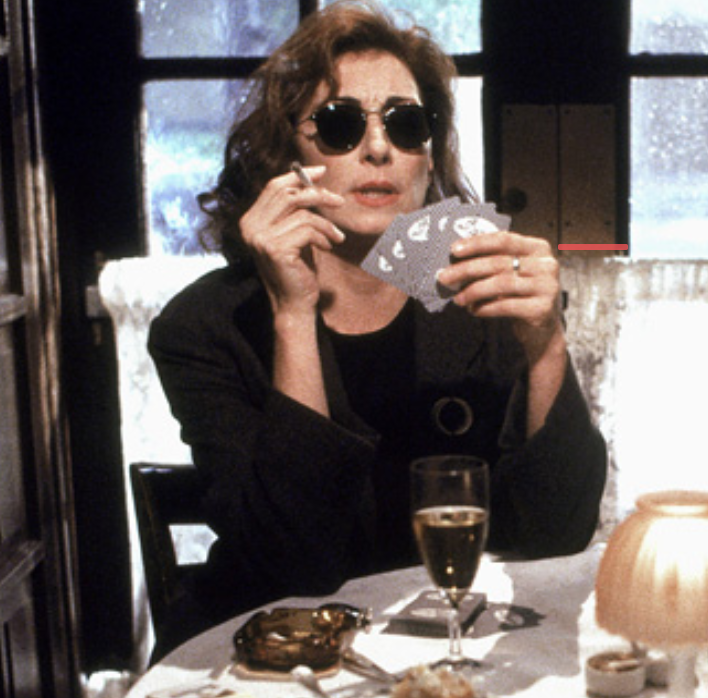 In my favorite Anjelica Huston performances, she portrays strong characters almost like bubbling pots. The strength is always there, but it's kept under a tight lid of self-control. Which it could be said, is another form of strength, after all. But ah, here is another tie to why I might be obsessing over Huston at the moment. Have you ever seen her play an airhead? Can I tell you the truth about something? This is a real confession here and it's just dawning on me. I dumb myself down. A lot. Because I'm embarrassed by my need to delve in such pretentious academic ways. I'm annoying when I voice an entire train of thought. I over-think movies and TV. I know I do. But it's how my brain really functions. It's what I love to think about and talk about. Our culture consumes entertainment voraciously en masse, so doesn't it matter what we consume? I've been hidden and unfriended from facebook for my blatant pretentiousness. And I really don't mean to be that way. As a result, nowadays I try to self-censor a lot more than I once did. You know even back in Junior High, I lied about honors English being too difficult for me so I could change lunch periods and join some of my friends who were annoyed that my honors English class put me on a different schedule. (And the class was a piece of cake.) That one lie changed the entire course of my education and it still bothers me when I think about it. 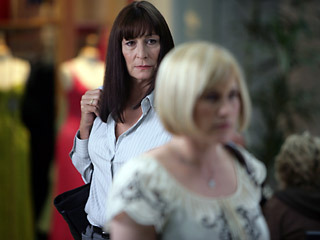 Anjelica Huston plays concentrated roles. Power. Strength. Intelligence. There's never a drop of compromise. That's part of what draws me to her performances. I see something truly admirable in Huston's roles. Something cathartic in that, "I am the way I am." thread that weaves through most of her films and TV appearances. Without going into specifics, I'll just say, I wish I could be that brave. I wish I didn't frustrate people or annoy them. I wish I didn't care so much. That my chest didn't fill with that kind of angry heat when I start talking about feminism in film. That being driven and passionate didn't automatically translate to "bossy" or "pushy". I wish I cared about something else. Maybe I can retrain myself at some point. How on Earth will I ever use talking about movies and TV to make the world a better place? Kudos to Jill Christman for creating a method of digging into your inspirations that leads to self-revelation. Who knew that watching a TV show could lead to reading the bones? I didn't know I was going to be writing about any of this when I started blogging this morning. But there it is and apparently, I have some issues to work through right now. More than anything else, the truth is that I just think Anjelica Huston is amazing. Classy, lovely and gifted. And what kind of fangirl would I be if I couldn't just appreciate art for art's sake? For years, I've cited Morticia Addams as a role model. As I get older, that remains true. 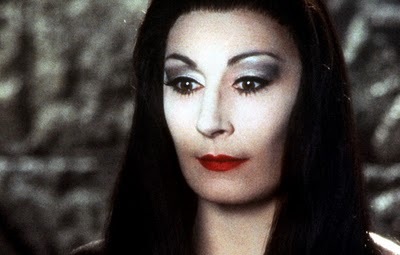 But lately, I'm realizing that it's less Morticia and more Anjelica, the woman under the makeup, that inspires me. Such a cheesy ending. But there it is. Help! I'm filled with ennui! Send cookies!